December 2013: Tips, eNews & More! As this year comes to a close, and we eagerly anticipate what 2014 will bring, we would like to take this opportunity to say Thank You to you, our valued patients. 2013 was a great year for us, and we hope it was a great one for you too. And don’t forget, your dental benefits may reset at the end of the year, so be sure to request a final appointment to avoid missing out on any benefits. Please be advised that our office will be closed from December 20th - January 3rd. 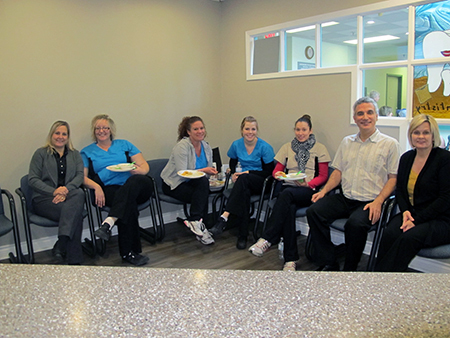 Dr. Benedict and the team shared an awesome potluck lunch on November 19, 2013.
scalloped potatoes, buffalo spicy chicken dip, beef on a bun, nachos, a fruit tray, and a delicious “Movember” cake and banana caramel pie rounded out the menu. It was an absolute “touchdown”. The buffalo spicy chicken dip was fantastic - not to mention an awesome treat for holiday get-togethers - click here for the recipe! Click here for more pictures of our potluck, and stay tuned for future team events! If not, there's still time to donate items to our food drive. 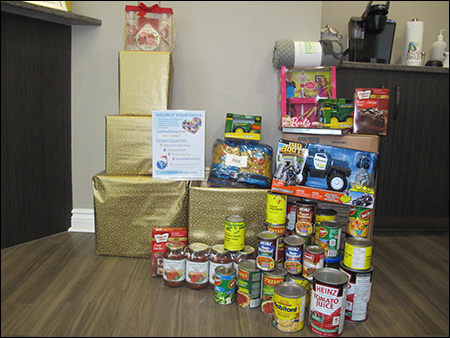 We have been collecting non-perishable foods, canned goods, and unopened toys since October 1st, and our food drive will continue until December 13th, 2013. 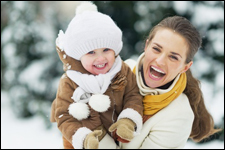 Port Hope Dental is offering $100 off on Zoom! Whitening this month. The offer is valid until December 18th, so hurry in to take advantage of the holiday savings. You asked, and we answered! 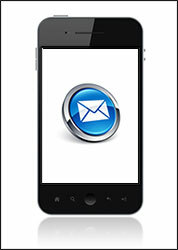 GOOD NEWS - at Port Hope Dental we can now confirm your appointment electronically via text message and email. Please let us know your email address, cell phone number and your confirmation preference. You will be able to simply click on a confirmation link and your appointment will be automatically confirmed in our schedule. You can also add your confirmed appointment to your calendar. If you have more than 1 appointment on the same day, our system will automatically send an email for both appointments. At Port Hope Dental we believe that communication is the key to a good relationship, and this is just one of the ways we are working to better serve you! Looking for a delicious treat to enjoy after your holiday feast? 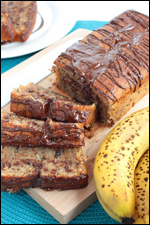 This recipe for Chocolate Banana Loaf is just what the doctor dentist ordered! It’s quick, relatively simple and super yummy! This recipe is flexible, you can use melted butter instead of coconut oil or blueberries instead of chocolate. Either way, it’ll be delicious! Click here for the recipe to get you started!